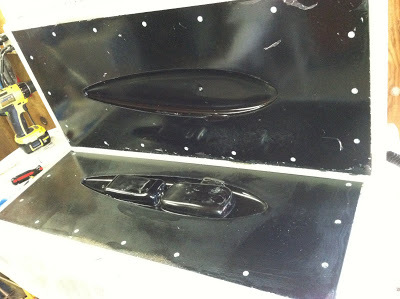 After repeating the process for the back half of the mold, this morning I went out to the shop and separated the mold halves to see if I was successful. The anxiety with molds, especially multi-part molds, is the investment of time. You have to completely finish the project before you can know if the very first layer of gelcoat actually cured out.. or if the plug was prepped well enough to release from the tool.. or if print through has ruined the mold surface.. etc. This mold was a six week project. The details between all of the steps have been skipped here. Between each picture there were usually days of sanding or spraying or buffing or sweating, often just to fix a mistake. Each small step took a painful amount of time. Another week will be spent improving the mold surface for production quality – and constructing jigs and flanges that will allow me to pull a joined and fully completed part from the mold without any work after the layup process beyond drilling a few holes and buffing out the finish. Cross-bracing the back side mold, just like the other side. 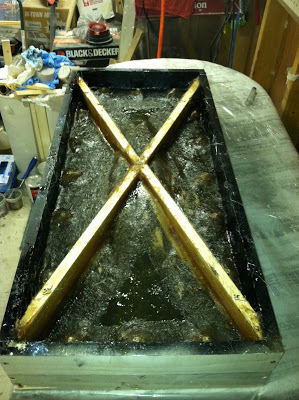 Bondo is used to space the wood away from the glass, preventing print through and pooling of resin under the wood – which would go nuclear during the curing process and compromise the mold surface underneath. 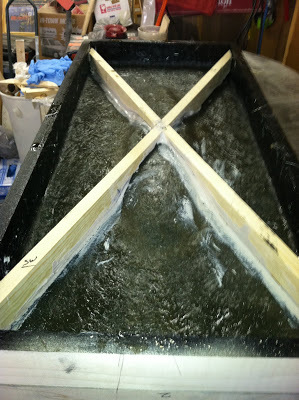 The final step: glassing the cross-braces on as well as the 16 tee nuts that will align and join the mold halves later. Bolts are already holding everything together and will be broken free of the resin with an impact drill later. Sneak peak.. All is well inside the mold. The roughness and flaking is left over mold release film that hasn’t been cleaned off. The mold surface looks awesome. The plug broke in half in the process of removing it, but I was expecting that considering the lack of relief in the gps and vario boxes. Same thing happened on the Geko/6030 mold.